The percentage of hours worked by diverse DWT partners on Microsoft matters increased from 39 percent to more than 50 percent over the past two years. “DWT met or surpassed expectations for all of this year’s Law Firm Diversity Program metrics, which focused on management committee diversity, firm-wide partnership diversity, and diversity of the partners working on Microsoft matters,” Microsoft said in a Dec. 11 announcement. The law firm, which has been participating in Microsoft’s program since its inception 10 years ago, will receive a bonus equal to a percentage of the firm’s legal fees for services performed for Microsoft during the fiscal year. The percentage is calculated according to how many points a firm accrues. The points are awarded based on how diverse the firm is in specific areas like partner composition and executive committee composition. Microsoft uses an incentive-based approach because it makes clear “that we not only value diversity and pay attention to this when we hire firms, but also that we’re here to work with them to improve together,” Microsoft Corporate Vice President and General Counsel Dev Stahlkopf told Bloomberg Law in an email. Microsoft defines “diverse” as attorneys who are female, racial and ethnic minorities, openly LGBT, people with disabilities and veterans. Microsoft is one of several large companies that have tried to use their leverage as clients to boost law firm diversity performance. “We look forward to a day when the legal industry fully reflects the world it serves,” Stahlkopf said. “Even though we’ve seen measurable progress to that end there’s much more to do,” she added. DWT’s Gray told Bloomberg Law that more and more of its clients are seeking to increase diversity within their own legal departments as well as their outside counsel. Despite pushing for greater diversity, Microsoft has acknowledged it has room to improve on the issue within its own ranks. As of June 30, the company reported that 26.6 percent of its U.S. employees were women, up 1.1 percent from last year. African-American and black employees make up 4.1 percent of employees, up from 3.9 percent last year. This year marks the 10th anniversary of the program, which uses bonuses as an incentive for Microsoft’s outside counsel to improve the diversity of its teams doing work for Microsoft as well as the leadership structure of those firms. The program began under Brad Smith, Microsoft’s former general counsel and current chief legal officer. It has continued under his successor, Stahlkopf. 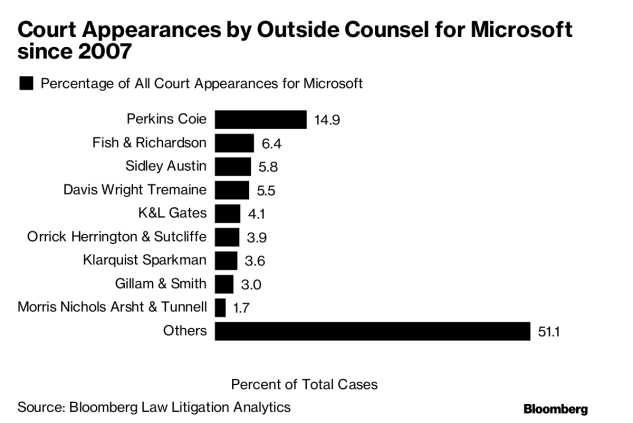 Davis Wright Tremaine has represented Microsoft in 5.5 percent of all court appearances made by law firms on the company’s behalf since 2007, according to Bloomberg Law’s Litigation Analytics. The other law firms participating in the Microsoft diversity program are: Arent Fox; Covington & Burling; Fish & Richardson; Greenberg Traurig; K&L Gates; Latham & Watkins; Merchant & Gould; Orrick, Herrington & Sutcliffe; Paul, Weiss, Rifkind, Wharton & Garrison; Perkins Coie; Sidley Austin; and Simpson Thatcher & Bartlett. Last year‘s top performer was San Francisco-based Orrick.